KTR Promotions in Venice Beach & Los Angeles California: PICK of the WEEK, This Sat, 10th Annual Mardi Gras Parade and after party! 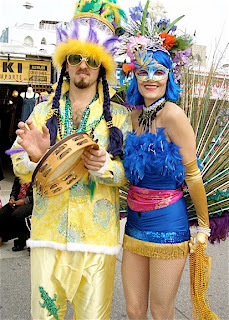 PICK of the WEEK, This Sat, 10th Annual Mardi Gras Parade and after party! Yes it’s still Mardi Gras time! At least it is, until FAT TUESDAY! So get your groove on and the wildest outfit you can find, or can make…and meet me on THE VENICE BOARDWALK at NOON. 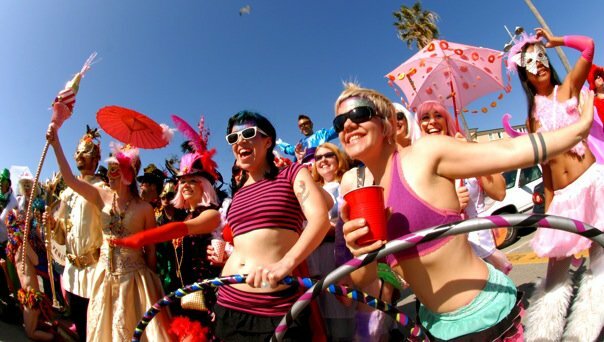 My Pick of the Week is this SATURDAY, March 5th….The 10th Annual Mardi Gras Parade which happens every year on the Venice Boardwalk. Remember this is a Daytime event. This Saturday’s event starts at noon at Rose Ave. We march/dance/hop/shake it up to Windward, then back we go. 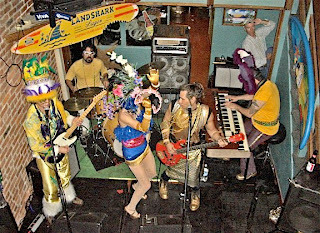 The after party continues at The Venice Bistro (323 Ocean Front Walk 90291) where the Gumbo Brothers and special guests will make us jump and shout… This year’s theme is "Cirque De La Mer" Circus of/by the Sea. See Saturday listings below, for more info. This is a free community event and will be a great party! I said FREE, Baby!!! Hhmmm, I wonder who actually hosts this event?… I am sworn to secrecy, even under threat of torture….ok tequila maybe. Once the parade is over, meet me at the Bistro….you are always welcome to buy me a margarita and see where it gets ya! Every Wednesday, Join deyermond art + books, 2801 Main Street, in Santa Monica, for an evening of spoken word, music, song and dance. 8:00-11:00 PM. http://www.deyermondbooks.com/. Refreshments served. Or you can always head down to the Venice Boardwalk to enjoy live music at The Venice Bistro (323 Ocean Front Walk 90291). 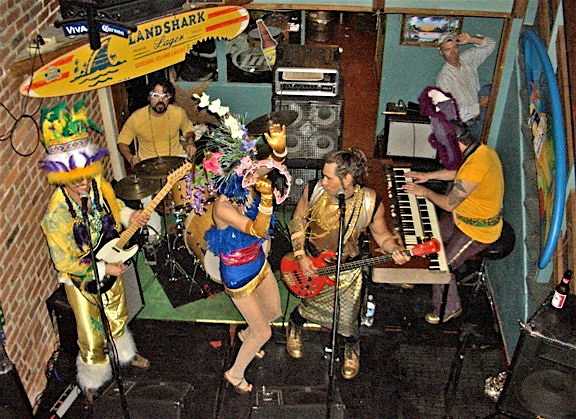 Rock out with The Venice Street Legends who play every Wednesday from 5:00 pm till 10:00 pm. Happy hour specials and dancing. For a larger food selection, go to Figtree’s Café, http://www.figtreescafe.com/ to have dinner (delicious happy hour specials), only a ½ block away on the boardwalk, at Paloma Ave, then pop back in the Bistro. Nikki’s is celebrating their 5 year anniversary with some special penny drinks between 9:00 and 11:00 pm. Say what? Yes you heard me right, drinks for a Penny. Woohoo!!! Geoffrey J will be providing music from 8:00 to 10:00pm with a 3 piece Acoustic Show with percussions (James Elliot & Rob Humphreys) also Miss Bonnie Miller will be singing some songs too!! Don’t forget to check out the beautiful art on the walls by Lauren Kutasi. http://www.laurenkutasi.com/; http://www.nikkivenice.com/. UCLA presents Fowler Out Loud, a new series, featuring FREE live music every Thursday in the Fowler Museum Courtyard with a reception and refreshments. This student performance series features up and coming artists and starts at 6:00 pm most Thursday nights. Remember these students have finals too, so some weeks, there may not be a performance. Be sure to check the calendar. Tonight’s event you can hear Random Voices, a fourteen member all-female a cappella group who has been together for 11 years. You can park in lot 4 which is self parking and depending on how long you stay will cost no more than $10.00. But be sure that you are in LOT 4. So pile all your peeps into the car and share the cost. 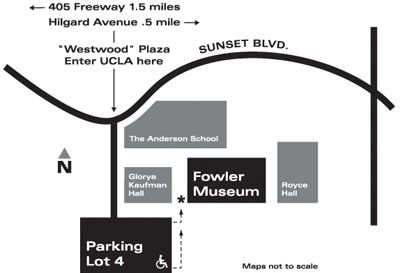 UCLA is located at Westwood Blvd and Sunset. See map for directions. http://www.fowler.ucla.edu/. If you have not heard the singer/musician, Spring, she is terrific and has a very original take on life. Tonight she performs a one woman show Spring Alive at the Main Stage at The Santa Monica Playhouse, a Guest Production. Show begins at 8:00 but don’t miss the pre-show reception which starts at 7:00 pm. Santa Monica Playhouse is located at 1211 4th Street Santa Monica, CA 90401-1391 Tickets are $10.00. RSVP info@springgroove.com. Or, how about a book reading with renowned author T.C. Boyle? Track 16 at Bergamot (2525 Michigan Ave) hosts An Evening with T.C. 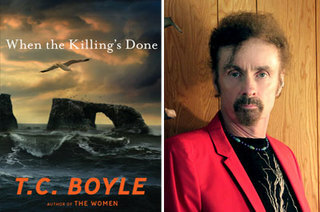 Boyle reading from his new novel, “When the Killing’s Done” The event runs from 8:00 pm to 10:00 pm. You can also stray from the Westside and head downtown to see the superb Suzy Williams, with Brad Kay on piano. There is a $10.00 cover on this one…but baby she is worth it. Suzy is a great friend of mine so I have seen her perform many times. This woman knows how to sell a song. Suzy performs from 7:30 - 8:45 pm at The Fedora Room West First St, Los Angeles CA 90012, 213-617-8555 http://www.firstandhope.com/. And the weekend kicks off with more Mardi Gras partying!!! Since it’s Mardi Gras time, and if you like to sing, you may want to start off your weekend with E.B. 's Rajun Cajun Karaoke at The Fairax Farmers Market. 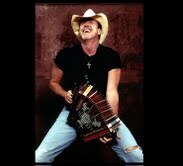 Starts at 8PM on the West Patio 6333 W. Third St.; 323.933.9211; http://farmersmarketla.com/. And don’t forget, its First Friday on Abbot Kinney again. In case you have never been, the festivities start around 6:30 pm. Stores stay open till around 9:00 pm.….With the recent arrival of food trucks upon the boulevard, some stores have decided to close early. However, here is a list of some shops that have confirmed with me that they will indeed be open and participating in the event. So start with these, and I’m sure you will stumble on more. The G2 Gallery at 1503 Abbot Kinney Blvd., Venice, CA 90291 will be having an opening reception with Paula Goldman during First Friday. Live music performed by Eric Kufs; 310-452-2842; http://www.theg2gallery.com. Right next door, you have to stop into Zingara Trading 1507 Abbot Kinney for their famous S'mores…Yum! I love this store, the clothes and accessories are simply gorgeous. They always have great sales on First Fridays and this Friday you can get a FREE henna tattoo. 310 392-6424; http://www.zingaratrading.com/. And across the street at one of my favorite furniture stores, Tumbleweed and Dandelion 1502 Abbot Kinney Blvd will be open till 8:30 pm with some refreshments, appetizers and a Furniture sale as well! 310 450-4310. http://www.tumbleweedanddandelion.com/. Surfing Cowboys 1624 Abbot Kinney Blvd will stay open till 8:30 for sure to show off their latest arrivals. phone: 310 450-4891 http://www.surfingcowboys.com. Bohemian Exchange 1358 Abbot Kinney Blvd will be open with some great sales. 310 396-3044; http://www.bohemianexchange.org//. You Need a Sofa 1344 Abbot Kinney Blvd will be open as well. 310 399-3928; http://www.youneedasofa.com/. Nitespa 1301 Abbot Kinney will be open for First Fridays and offer all kinds of little treats and specials during the evening. They always create a fun festive vibe. Enjoy rosemary water, organic teas and wine. There will also be art and jewelry for sale. Open till 10:00 pm. The entrance is on Santa Clara. 310.396.5122; http://www.nitespa.com. Also Gumbo Kinney is having an event at 1130 Electric Ave (right behind AK Blvd. )and they just got a brand new piano a Steinway upright. It's been ringing since 1901 from Greenich Village to here. Guests are allowed to play a tune or two. However, it’s BY INVITATION ONLY. Invites may be procured by emailing a request to gumbokinney@gmail.com. Altered Space Gallery 1221 Abbot Kinney Blvd will be open and serving refreshments, as well as showing some new water drip sculptures and sconces by Tanya Clarke. Tanya works with Polaris, a Canadian water conservation project, and she donates a portion of her proceeds to them. She is a Venice resident but originally from Canada 310-452-8121; http://www.alteredspacegallery.com/. Now this may be a great place to end the evening with some drinks and dancing. Joe's Restaurant invites you to a night of hot jazz on their heated back patio with KCRW’s Tom Schnabel who headlines the evening. Show starts with the remarkable Jessica Fishot (7-8pm), followed by gypsy swing from Icy Hot Club of California (8-10pm), closing with a big finish is acclaimed DJ Tom Schnabel who keeps the world beat spinning from 10:30 to Midnight. Reservations are suggested. RSVP at Joe's Restaurant, Call (310) 399-5811, or email joesevent@yahoo.com. Joe's Restaurant is located at 1023 Abbot Kinney Blvd. Venice CA 90291. http://ww.joesrestaurant.com. Hey, you may as well continue the evening, by jumping in the car to Silver Lake. La Luz De Jesus Gallery presents their 14th annual juried group exhibition Everything but the Kitschen-Sync, Volume XIV. This large show is an incredible opportunity for art collectors to peruse close to 250 pieces of juried artwork by 125 artists all in one viewing, and obtain undiscovered art at undiscovered prices. The opening reception starts at 8:00 pm and will run till 11:00 pm. PICK OF THE WEEK is the 10th Annual Venice Beach Parade with Critical Brass Band and The Mardi Gras Drum Tribe. Remember this is a Daytime event. This year’s theme is "Cirque De La Mer" Circus of/by the Sea. Come line up at 11:30! We start to move at noon. Costumes are appreciated. Grab some seaweed, beads some sea shells, whatever, doesn’t matter, it’s all about your attitude and willingness to shake your booty!!! Better save some energy for the after party at The Venice Bistro (323 Ocean Front Walk 90291) where the Gumbo Brothers and special guests Critical Brass and Miss Jessica will keep the party goin’ on from 2:00 pm till 5:00 pm. Free, No Cover. Now I do realize some prefer a more mellow evening. 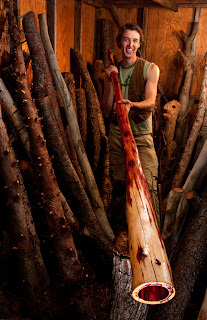 So you may want to stop into The Aboriginal Dream Time Gallery, located at 9011 Melrose Ave in West Hollywood, 90048. This gallery features a wide variety of Aboriginal Art with some of the better known artists such as Ningura Napparula, Walangkura Napanangka, Evelyn Pultara, Thomas Tjapalltjarri, Betty Mbitjana and many more! OR support an important cause and go see the band VENICE, who is performing in the Artists for the Arts Foundation Concert at Santa Monica High School. Don’t forget it’s tax-deductible. This year, Santa Monica-Malibu Unified School District Student Musicians will be performing with the Grammy award winning band, AMERICA, renowned vocalist RICHARD PAGE (Mr. Mister) and a legendary Special Guest! Hosting this event for the 5th time will be MARK STEINES of Entertainment Tonight. 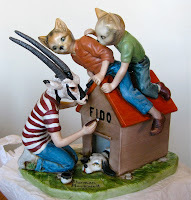 How bout heading downtown to one of my favorite galleries, the Hive Gallery? Located at 729 South Spring St, this edgy gallery always has fabulous openings. Though they do charge for some of there openings to cover costs, it is always worth it. 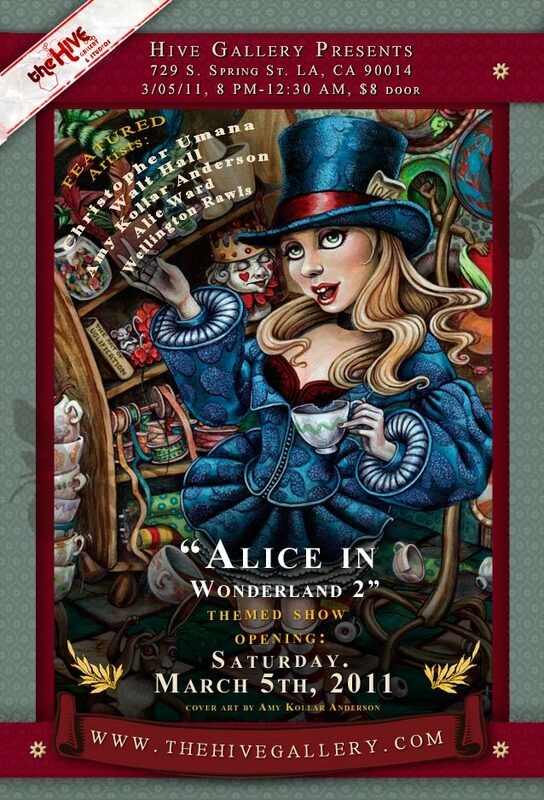 This event is called Alice in Wonderland 2 and runs from 8 pm-12:30am $8 at door/ $5 for those dressed in Alice in Wonderland costume. So get creative or just grab a tea cup or a clock…Come on people, it’s not that hard to throw something together. Artists featured in this group show are Christopher Umana, Walt Hall, Amy Kollar Anderson, Alie Ward and Wellington Rawls. http://hivegallery.com/2010/. 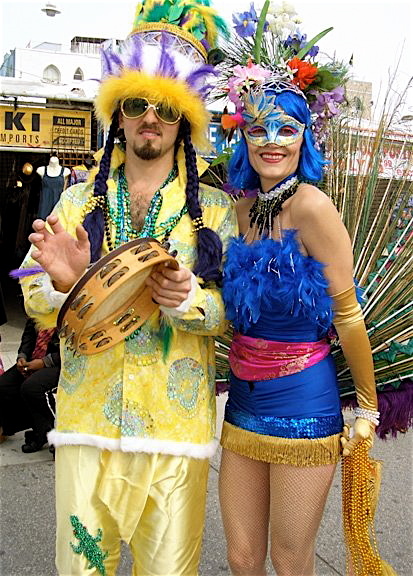 FAT TUESDAY is the official day for Mardi Gras…..if you have not been celebrating thus far, this is the time to hop to it. Come join me at South, (3001 Wilshire Blvd., Santa Monica, CA 90403. The Gumbo Brothers will play from 8:00 pm to midnight. This place has great southern food too. They also have a happy hour from 3:00 pm to 8:00 pm (3 dollar drafts, 5 dollar wells, ½ off majority of Apps). So get there early. South will also be serving some special New Orleans grub for this special night such as Crawfish Boil (poached in court-bouillon) w/ corn and potatoes served individually, Jambalaya Skewers, Fried Oyster Shooters, Blackened Chicken Spring Rolls and Chess Pie. Drink Specials include Hurricanes, Abitas (bottle and draft), and the specialty cocktail for the evening, “The Fat Tuesday”. This one may be the one for me….yum! It’s gonna be a fun night they’ll have beads, hats and much more. (310) 828-9988 http://southsantamonica.com/. Eddie Baytos & The Nervis Bros perform from 6:30 till 9:00 PM on the West Patio at The Fairax Farmers Market, 6333 W. Third St.; 323.933.9211; http://farmersmarketla.com/. Then Eddie Baytos & The Nervis Bros move to a new location play at Fai Do Do for CARNI-GRAS- for their FAT TUESDAY Celebration. See pix of Eddie Baytos on right. 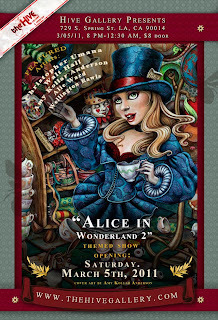 CARNI-GRAS Is Carnival & Mardi-Gras combined event. They will be sharing the stage with Lula & Afro-Brazil Show starts at 9:00pm till whenever. Fai Do Do recently re-opened and is located at 5257 W. Adams LA. There is a $10.00 cover for this one….but the party goes on till midnight…or later. Dress Wild--bring percussion Instruments! Time to recoup…..whew! What a week….see ya next time! Pick of the Week...First Fridays on Abbot Kinney! Weekend Update....So much to do! Keep the party going on with FAT TUESDAY!!! Weekend Update....Mardi Gras just keeps on going!